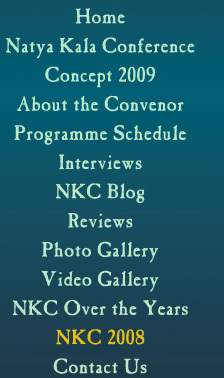 The NKC 2008, was a benchmark of NKC itself!,Fromits topic to speakers,to participants to its organisation - it showed class and substance. A team of devoted dancers associated with the dynamic dance talent ASJ(Ananda Shankar Jayant) did all to make the event , memorable. It will go down in dance history as one of the best organized and convened NKC's. And how did this happen? What's its success mantra or recipe? Team Work: From the host9 the staid Krishna Gana Sabha), inviting ASJ to convene for 2 years, to ASJ seeking inputs of all and learning from many; to superb subject and speakers, to an excellent grip on what works and what doesn't. The Ramayana conference was a breakthrough in more ways than one. The visual communication was clear and consistent. The curating was almost perfectand the daily flow was maintained with time schedules kept vigilantly.Knowing the anthem of 'whining' that surrounds the dance world and the challenges of working with sabha organisers with traditional mindsets, Ananda broke through with sheer grit and advance planning. Ananda thought and behaved like a team manager, empowering, her colleagues and allowing both senior and junior presenters to voice and demonstrate their ideas to an interested audience. Ananda, skilfully navigated the shrill tones of " Hindutva"and allowed the perennial appeal of the story( Ramayana), to speak through the Conference.